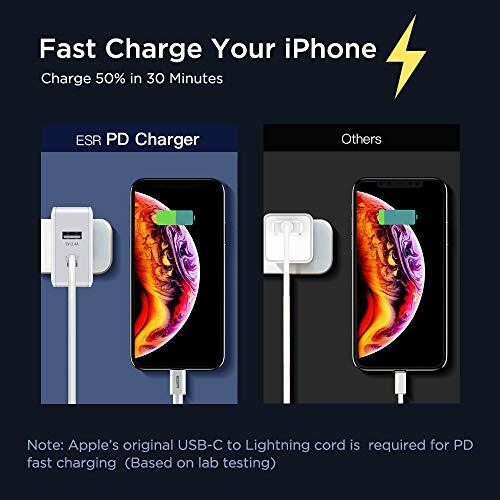 PD fast charging for USB-C devices supporting PD, QC and other fast charging protocols, including iPad Pro 12.9/11 2018, Samsung Galaxy S10+/S10/S10eNote 9/Note 8, Google Pixel 3/3 XL, Huawei P30 Pro/P30/Mate 20 Pro/Mate 20 and more. ESR PD fast charging products power your devices at an incredibly high speed. With Power Delivery (PD) technology, you can experience 3X faster charging. ESR fast charging products not only work with devices that support PD technology but are also compatible with other fast charging protocols such as Huawei FCP, Samsung AFC, Qualcomm QC 2.0/3.0. This universal compatibility really makes charging easier. 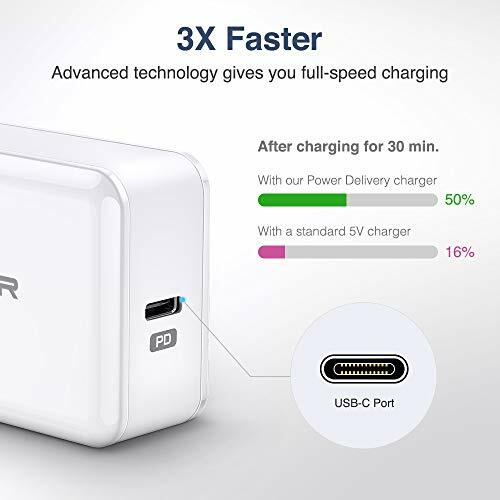 Besides its universal compatibility, the ESR charger can also automatically detect and deliver the optimal charging power for connected devices. Your devices are charged at a high speed without damaging the battery life. Very reliable. I have the possibility to charge my iPhone and my iPad at the same time.